If your house is anything like mine then you are sure to have a hair bobble monster that gobbles up all the hair bobbles lying around. I swear this monster is worse then the sock monster as we lose more hair bobbles than we do socks. But this ingenious idea helps keep them all in one place….and frankly saves me shouting ‘Where is your hair bobble?? ?” And the crazy panic in the morning because we have lost the last red/black hair bobble for school. So what is The Hair Helper? 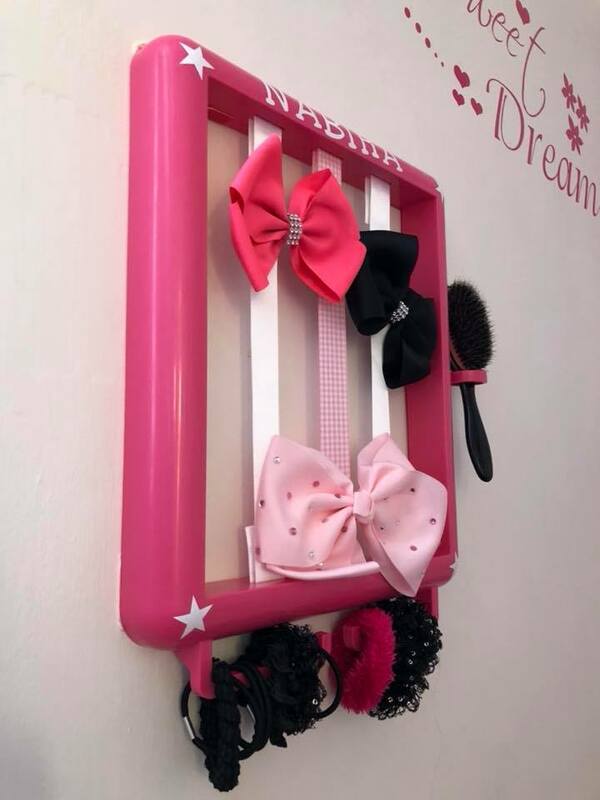 The Hair Helper is a very simple design consisting of a frame to hang on a wall, with hooks and ribbons that fasten to carry all your hair bits and bobs. 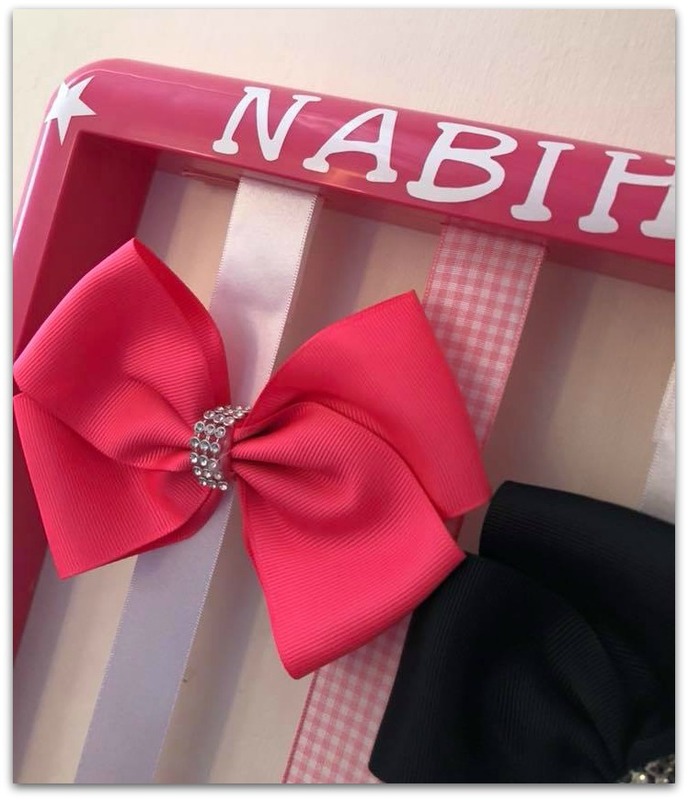 The Hair Helper is priced at £17.99 which includes 3 satin ribbons (a choice of colours) and a choice of a white or pink frame. 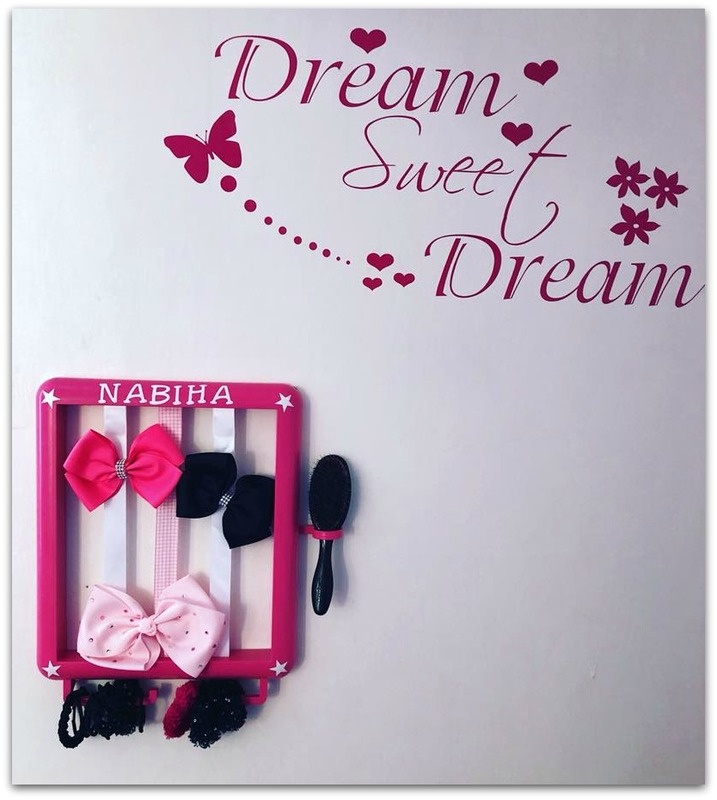 However you then get the option to personalise it further by adding letters for names and decorative stickers such as stars, hearts, unicorns and butterflies. Each letter and extra motif cost 20p each. The Hair Helper arrives packed with the letters and pictures separate so you can place them on the frame yourself. Along with a brush holder and screws and mounts to help hang up the frame. It is all straightforward to put together. 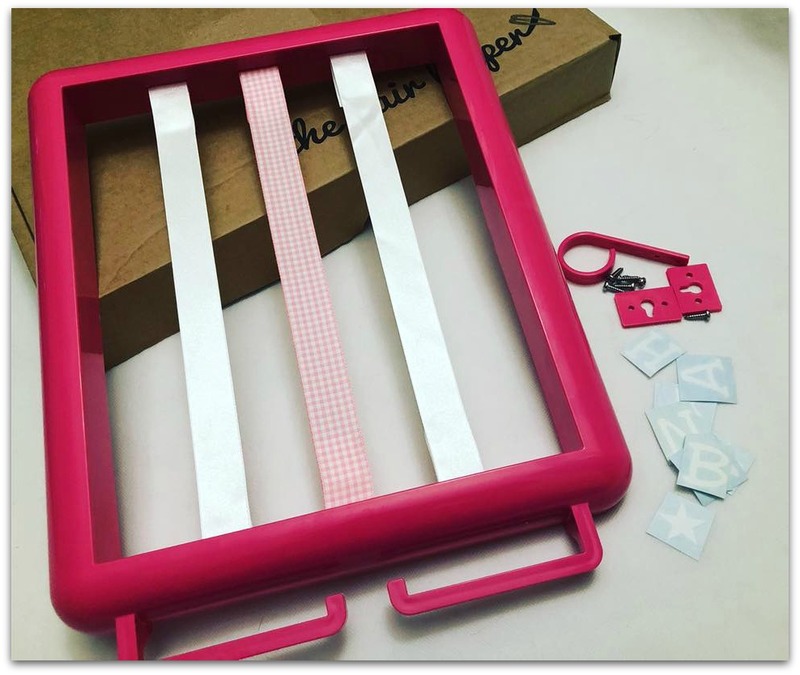 The Hair Helper is very simple but it totally works and is perfect to hold hair bobbles, clips and bows. We have hung it up at a low level so Bee can easily access it herself rather than asking us all the time to get her the bow or put it back for her. We love the fact that there is a hair brush holder too as that is another item that we also seem to lose on a regular basis. As I didn’t want to make any holes in the walls to hang it up, I actually ordered some double sided tape which is perfect to hang pictures up, amongst other things. As the frame is so lightweight I thought I would try it with the tape and so far it has held in place. What is also great about it is that The Hair Helper will be unique to each child due to the personalisation options. You can have each ribbon a different colour, or the same if you want and pick different sticker motifs aswell. The Hair Helper is a definite must have item for any child that loves their hair accessories and needs something to help organise them all! Although Bee now wants to buy more hair clips to put on the ribbons as there is still plenty of space…and she’s lost all her old ones! My eldest was never really into hair accessories as much as Bee is at the moment; the Hair Helper has certainly made things easier for us in the mornings to find her hair bobbles. And hopefully I will no longer be finding random hair bobbles on the floor! You can find out more about the Hair Helper and purchase it from their website: The Hair Helper. Disclosure: We were sent a Hair Helper for the purpose of review. However all thoughts and opinions are our own. Argh I’m very familiar with the hair bobble monster! Horrible creature! I love this little gadget… If it wasn’t so very clearly made for little girls I might be tempted to get one myself, haha! Thank you for review, didn’t know any such product even existed. I need one of these. It is an awesome way to organise hair accessories, I always lose mine. I personally love that it is pink.